The tightness control TC checks the fail-safe function of both valves before each start-up or after each shut-down of a system with two safety valves. The aim is to identify an inadmissible leak on one of the gas valves and to prevent burner start. The other gas valve continues working properly and takes over the safe shut-off of the gas supply. TC is used in industrial thermoprocessing equipment, on boilers, and on forced draught burners. Standards ISO 13577-2, EN 746-2 and EN 676 stipulate tightness controls for capacities over 1200 kW (NFPA 86: from 117 kW or 400,000 Btu/h in conjunction with a visual indicator). Pre-purge of the combustion chamber can be dispensed with under certain conditions in accordance with EN 746-2, if a tightness control is used. In this case, the system must be vented into a safe area. Tightness control TC 1V can be directly flange-mounted to all valVario controls. There is only one version for all sizes. Tightness controls TC 2 and TC 4 can be used with gas solenoid valves of any nominal size, which are quick opening or slow opening with start rate. It is possible to conduct a tightness test on pneumatically operated or slow opening valves without start rate by using additional auxiliary valves. Slow opening motorized valves VK up to DN 65 which are directly flanged within a temperature range of 0 to 60°C (32 to 140°F). An adapter plate is provided for installation of the TC 2. Tightness control TC 3 is a universal device for quick and slow opening gas solenoid valves of any nominal size as well as for motorized valves. The tightness test is carried out with the valves installed in TC 3. 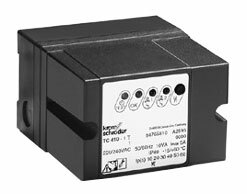 Tightness control TC 4 consists of detection circuitry and can be installed in the control cabinet, separately from the system. An external pressure switch takes over the mechanical pressure test between the valves. Tightness control TC 4 is independent of gas type and inlet pressure and can be used for a test period of up to ten minutes with a large test volume. Click Here for Help choosing which model you need.